Dr. Michael Greger, of www.nutritionfacts.org, has a fantastic iPhone/Android app (that you can download for FREE) called “The Daily Dozen”. This app gives you a checklist of healthy, whole plant-based foods to incorporate into your day…EVERY day! It also assists you in determining proper serving sizes and offers different options for each category. 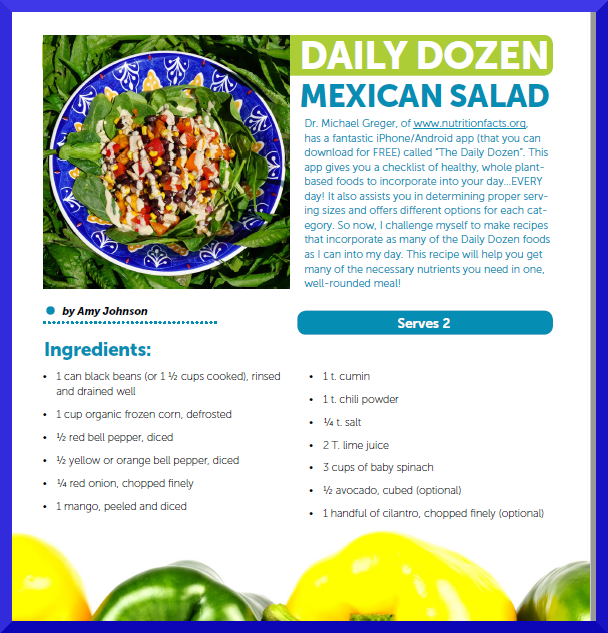 So now, I challenge myself to make recipes that incorporate as many of the Daily Dozen foods as I can into my day. This recipe will help you get many of the necessary nutrients you need in one, well-rounded meal! To make the salad, gently mix the beans, corn, peppers, red onion, mango together with the spices and lime juice. 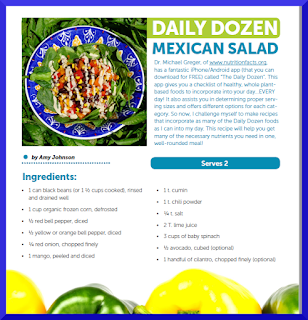 Decorate your plate with lots of baby spinach and add the Mexican salad mixture on top of it. Sprinkle on chopped cilantro and add avocado, if desired. Drizzle on the dressing (below). Toss to mix well. Serve! To make the drizzle dressing, simply stir the ingredients together in a small bowl. Taste and adjust seasonings. Drizzle onto salad and toss through.